The survivors of the sinking of the USS Callaghan (DD-792) and their family members met in New Orleans for their annual reunion on January 19 to 22, 2012. At 12:40 a.m. on July 29, 1945, a kamikaze pilot crashed his biplane with fixed landing gear into the destroyer Callaghan on patrol at Radar Picket Station 9 about 70 miles to the west of the southern tip of Okinawa. The attack by this training plane carrying a bomb killed 47 crewmen and one officer. Survivors of the attack have met regularly since 1972 for a total of 26 reunions in order to remember those men who gave their lives. 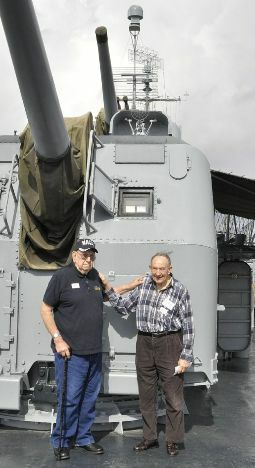 Four USS Callaghan survivors (James Bond, Wally Brunton, Bob Cooper, and Mike Novelli) attended the 2012 reunion with about 20 other persons, who were mainly family members of men who served on the USS Callaghan. At my first Callaghan reunion in Cincinnati in 2007, there were 17 survivors in attendance, but the number has dropped sharply since then as some surviving shipmates have passed away and others can no longer travel long distances. They enjoyed meeting together in Waterloo (Iowa) in 2008 near Bob Cooper's home, Fredericksburg (Texas) in 2009 at the National Museum of the Pacific War, and Philadelphia in 2010 near Mike Novelli's home. 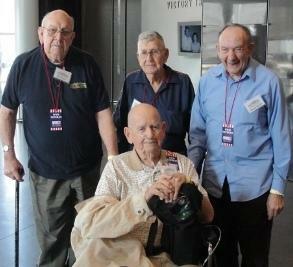 The 2012 Callaghan memorial service was held on Friday, January 20, at the National World War II Museum in New Orleans. After the presentation of colors by a local high school Naval ROTC color guard and the recitation of the Pledge of Allegiance, Darby Cooper, grandson of Callaghan survivor Bob Cooper, gave a brief history of the last destroyer lost to enemy action in WWII. Next, the names of each of the 47 crewmen and one officer lost in the kamikaze attack were read. A bell was rung after the name of each person was read. The ceremony concluded with a recording of "Amazing Grace" and the retirement of the colors. Harriet Hadley and Gloria Diane Hummel came all the way from their homes in Texas and Kansas to attend the remembrance ceremony held at the National WWII Museum. Their father, Harry Smitherman, died when the kamikaze plane hit Callaghan. The two daughters sought for many years to find someone who knew their father during the war, and in 2006 they finally located Bob Cooper, who has corresponded by e-mail with them since then and who was overjoyed to see them in person at the ceremony. The web page on the 2007 USS Callaghan (DD-792) Reunion has a photograph of Harry Smitherman and a poem written just after his death by his Grandma Nano for his two daughters. his son James Bond, Jr. The Callaghan reunion group toured the huge National WWII Museum after the memorial service with the focus being on the Pacific theater of operations where the destroyer Callaghan served from early 1944 while earning eight Battle Stars. We ate lunch together at the museum's Stage Door Canteen with the walls filled with photographs of WWII singers and movie stars who entertained American GIs. After lunch, our group saw the film Beyond All Boundaries, a 4-D movie that includes wartime film clips and many special effects. The museum theater's flashing lights and loud sound effects brought back many memories for the four survivors, especially when they viewed a kamikaze aircraft crash into an American warship. During lunch my wife Noriko and I sat at the same table with 90-year-old Callaghan survivor James Bond and his son James Bond, Jr. They had driven the previous day about four hours from Monroe, Louisiana, in the northern part of the state. We were somewhat shocked to find out that James Bond's wife Oreatha, who we met at the Cincinnati reunion in 2007, had passed away after a lengthy illness on the same day they left Monroe. He explained that he really wanted to go to the memorial service, since it was most likely the last one that he would be able to attend. They planned to return to Monroe soon after lunch for Oreatha's funeral service the next day. James Bond, who had been wounded with shrapnel during the kamikaze attack on Callaghan, gave me his personal web page address that had been created by a granddaughter. I entered the address in my phone to bring up the page, which showed a photo of a handsome guy when he entered the Navy almost 70 years ago. He explained how his records were lost in the Navy after the sinking of his ship, so he never received any of the several medals that he had earned during his service on the destroyer Callaghan. His wife Oreatha pursued through various channels the recognition that he deserved. He showed us his DD Form 214, which was a correction form for his Certificate of Release or Discharge from Active Duty. His awards included a Purple Heart Medal, Asiatic-Pacific Medal with one Silver Star, Philippine Liberation Medal with two Bronze Stars, and Philippine Presidential Unit Citation. His web page has a photograph of his US congressman, Rodney Alexander, presenting him with the medals on the day before his 90th birthday. On Saturday, a group of ten people including survivors Mike Novelli and Bob Cooper drove over one hour to visit the destroyer USS Kidd (DD-661) in Louisiana's capital, Baton Rouge. USS Kidd is a museum ship that has been restored to her configuration in August 1945. A kamikaze plane crashed into Kidd killing 38 men and wounding 55 others on April 11, 1945. Callaghan and Kidd are both Fletcher-class destroyers, so Mike and Bob felt like they were coming home when they toured the ship. For the WWII veterans, the tour guide opened up several compartments usually closed to the general public. While some reunion attendees went to Baton Rouge, a group of eight persons took a tour of the city of New Orleans during which they viewed sights such as a cemetery with above-ground tombs and areas devastated by Hurricane Katrina in 2005.
as a bridge of peace and friendship between our two nations. Kaoru Hasegawa, Chairman, Rengo Co., Ltd.
Hasegawa after the war's end went to work for Rengo, a large packaging company, and later become president. He attended two reunions of Callaghan survivors in the 1990s in order to thank the former crewmen for his rescue. He helped to establish the US-Japan Maritime Youth Exchange Program to bring together high school students from Japan and the US for a three-week program of travel and study in both countries. Callaghan Survivors Association members have created notebooks of historical material and photos related to the destroyer. While the reunion group was in New Orleans, a curator from the National WWII Museum examined the comprehensive materials and said that the museum would be very interested in receiving them when the association is ready to donate them. 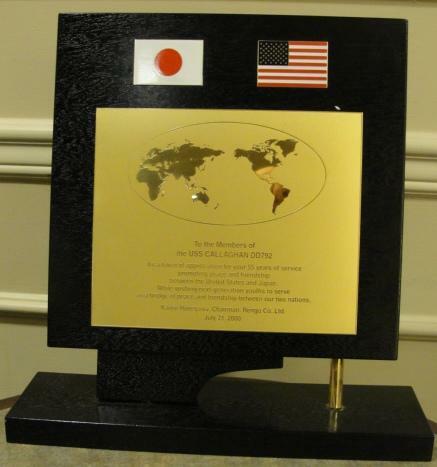 He served as a former curator at the USS Kidd Museum in Baton Rouge, and he indicated that the Kidd Museum would most likely be interested in receiving the plaque from Kaoru Hasegawa, the kamikaze pilot rescued by Callaghan about two months prior to her sinking. In the hospitality room, Wally Brunton mentioned some of the positive influences that have come about from the annual Callaghan Survivors Reunions that have been held over the years. 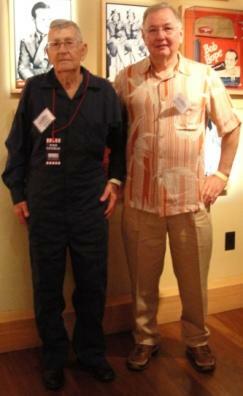 In one reunion at Bath, Maine, he was interviewed for an article published in a local newspaper. He was surprised when he received a call from the former wife of Gilbert Paine, the one officer killed in the kamikaze attack on Callaghan. She had read the newspaper article about the Callaghan reunion, and she attended that reunion in Bath and a couple afterwards. Maureen Glanzer came all the way from South Dakota to attend her first reunion this year in New Orleans. Her husband, who has passed away, was a nephew of Don Glanzer, who was killed in the attack on Callaghan. This was the first time that anyone from Don's family has had the opportunity to attend a Callaghan reunion. The Saturday night banquet with 20 reunion participants took place right on Bourbon Street with an excellent dinner served at the Bourbon House Restaurant where most people selected the tasty New Orleans style barbeque shrimp. At our table there was discussion of the number of Bob Cooper's family who attended the reunion: eight in total including two daughters and their husbands, three grandchildren, and the wife of one of these grandchildren. During the time in New Orleans there was some discussion about whether there were enough people to continue to hold the reunions. Darcy Cooper, a grandson of Bob Cooper who did an excellent job in putting together the reunion in New Orleans, volunteered to organize future reunions if there was enough interest among Callaghan Survivors Association members.